Yesterday, I looked at the NYSE Margin Debt levels. On a short term basis, they don't tell you a whole lot, but from a longer term perspective they do tell a story. Sometimes, I think of the NYSE margin levels as being similar to monetary liquidity or credit crunch conditions. When margin debt is expanding, investors are confident and expose themselves to more risk in expectation of a rising stock market. When margin debt is contracting, investors reduce the amount of margin they use because they are less confident about future up moves in the market. Lower margin debt levels have a corresponding drop in the amount of liquidity for the markets. Retracting liquidity is always evident in stock market drops. 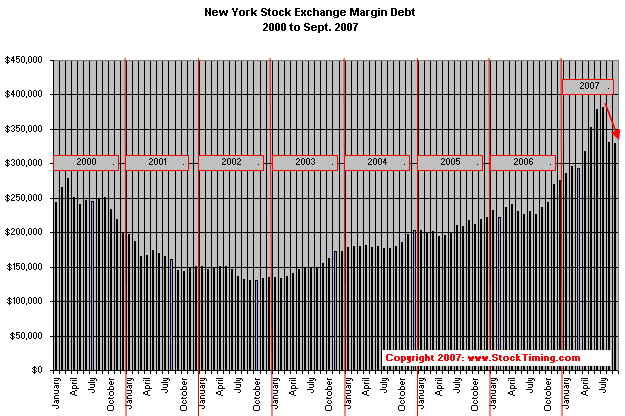 The Margin Debt levels on the NYSE from 2000 to September 2007 are below. Note how they started to fall at the end of 2000. Then, they were in a continuous downtrend in 2001 as we experienced the beginning of a bad bear market. It wasn't until early 2003 that Margin Debt began to rise again ... and along with rise, the stock market started its next bull phase. That takes us to what is currently happening. In August and September, Margin Debt on the NYSE had their two largest drops since 2003. Clearly, there is now less margin in use, and that is buying fewer stocks shares. Unless margin debt levels increase fairly soon, the market will face a tough 2008 for those trying to play the long side of the market, and it would be a good market for those who go Short. Marty Chenard is the Author and Teacher of two Seminar Courses on "Advanced Technical Analysis Investing", Mr. Chenard has been investing for over 30 years. In 2001 when the NASDAQ dropped 24.5%, his personal investment performance for the year was a gain of 57.428%. He is an Advanced Stock Market Technical Analyst that has developed his own proprietary analytical tools. As a result, he was out of the market two weeks before the 1987 Crash in the most recent Bear Market he faxed his Members in March 2000 telling them all to SELL. He is an advanced technical analyst and not an investment advisor, nor a securities broker.